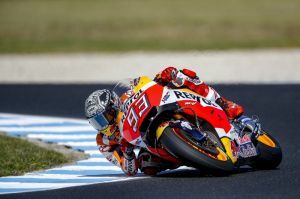 The first day of the Australian test has concluded with Repsol Honda’s Marc Marquez leading the field, his fastest lap of 1’29.497” just three-thousands of a second off the 2016 best race lap (1’29.494”). Teammate Dani Pedrosa kept a fast pace throughout the session and finished the day in seventh place. The day was windy but with blue skies and temperatures that rose from quite chilly in the morning to 30° C (41.8° on track). Marc and Dani began riding around 11 a.m. and continued working on their RC213V machines, both of which were fitted with the engine they had hosen in Malaysia two weeks ago.